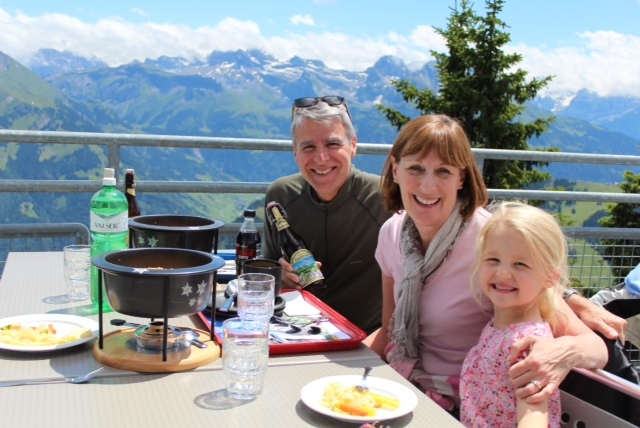 Just three weeks ago, my wife Mary and I were anticipating a long-awaited trip to Switzerland where we would visit our oldest daughter Kate, her husband Mark and two young children, Lena and Johnny. It was unlike me to be packed three days before our date of departure, which suggests how ready I was to see this family and to slip away from the work-a-day in Des Moines where we live. 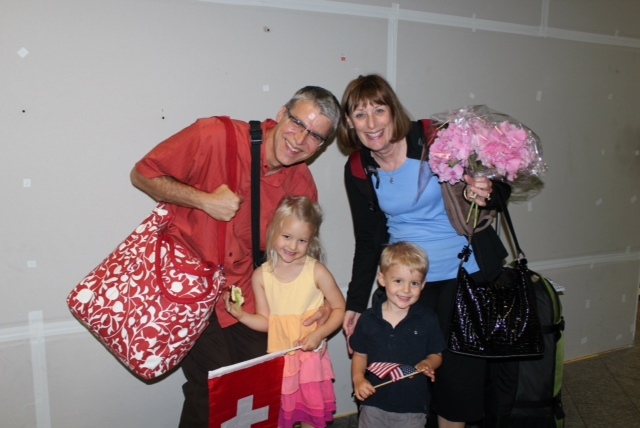 Years ago, Mary and I had always hoped we would travel overseas – we had our passports ready – but it wasn’t until Kate and her family moved there in 2010 that we had the incentive to make that happen. This trip would be our third since their assignment began and possibly the last to this location before they return to the U.S. It’s unlikely we will ever visit Switzerland again, so this visit had a slight melancholy feel about it. How can one not travel to Switzerland to see that? The primary purpose of our travel is to immerse ourselves in this all-too-distant family and to capture a snapshot of their Swiss life. Kate and Mark are gracious in allowing us to upset their family routine during our extended visits. I marvel at how easily and completely Lena (3 ½) and Johnny (2) embrace our company and how much they want to be with us. From the beginning, we are in high demand when it comes to seating arrangements, reading stories, playing games and tucking in at night. Of course it doesn’t hurt that their grandmother has a well-established reputation for delivering marshmallows and jelly beans whenever we meet, but I give credit and thanks to Kate for helping keep our distant relationships alive and for building the excitement for those special times we can be with each other. What I value most about our time with Kate and her family isn’t the visits to the castles, the beautiful mountains or lakes that are part of her Swiss environment as much as the everyday experiences and cultural differences of living there. I love waking up and sitting at Kate’s kitchen table, a room usually flooded with bright morning light, and enjoying a Nespresso longo or cappuccino as we plan the day. From that third-floor perspective, one can view a rural countryside dappled with small farms, orchards and fields growing a variety of crops including wheat, sugar beets, corn and hay. Swiss farmers make efficient use of every square meter of land available to them. From that same kitchen table, one can watch the bright red electric Swiss trains silently arrive and depart four times every hour – to the exact minute – at a station less than a block away. Walk 15 minutes west from the apartment building and you are in a forest – among tall pines where you feel their coolness and hear nothing but the soothing call of the doves that inhabit them. Walk 15 minutes east and you are among stores and businesses, including Kate’s preferred food store called Co-op. I take every opportunity to accompany her to the Co-op to compare the different foods, the common brands, as well as to view the beautiful array of produce, breads and cheeses the Swiss choose for their meals. Lena’s school is a simple walk in yet another direction – just past a small yard with goats and rabbits, and the tidy homes with their functioning shutters and flowering window boxes. The preschool itself contains a workbench featuring steel hammers and nails, coping saws with blades, hand drills with steel bits and blocks of wood – you’ll find no colorful, oversized plastic Fisher Price tools for these Swiss kinder. Switzerland takes me back to a simple, less complicated time, similar to the 1950s when I was growing up in southwest Iowa – a time when kids ran through neighborhoods, gathered on playgrounds and rode bikes without adult supervision – before there were fears of child molesters and abductions. People leave unsecured strollers and bikes parked outside stores, trusting they’ll still be there when they return. Individuals walk across streets, some without looking, knowing autos, trucks and bikes will stop for them. It is rare to hear the horn of a car or the blaring sound of someone else’s music. In the village of Biberest where Kate lives, businesses and grocery stores close on Sundays – encouraging family activities and visits. It seems people are content with having fewer things and smaller homes while placing a high value on the quality of their environment and how they live. There remains an air of innocence and respect for each other – a simplicity of life – that has been forgotten or lost in the U.S. today. For the first time since Kate, Mark, Lena and Johnny left, I find myself anticipating their return to the United States – it seems they are ready to return to family, as well. It’s time for all of us to be together. And as much as I look forward to having them “home,” I worry about their re-entry to the frenzied pace, the politics and consumerism they have been living without. My hope is we can all remember the lessons of that beautiful place and somehow apply them to the way we live here. This entry was posted in Switzerland and tagged Jim Head, Switzerland by Mimi Johnson. Bookmark the permalink.